As a kitchen assistant you will provide support to a Chef or number of Chefs in a kitchen area preparing food and ensuring the kitchen area is kept clean and tidy. It will be a busy role where you will spend a great deal of time on your feet running from one job to the next whilst maintaining a high degree of hygiene and consistency. Any interviewer will need to know how you multi task and what previous experience you have had in a busy kitchen or around food etc. 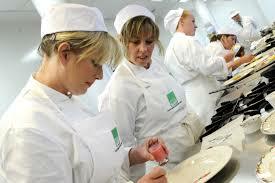 You can always be a kitchen assistant at a restaurant or hotel or anywhere with a kitchen. Qualifications are not necessary for this job title as training will be given from the company you will work for. Salaries will be above the national minimum wage depending on where you work. How do you keep a kitchen clean and hygienic following strict guidelines? Do you understand different preparation boards for different foods? How many covers has a kitchen that you have worked in before had to deal with on their busiest nights? How many staff and what kind of hierarchy are you used to dealing with? Have you just worked evenings or lunch times, all day as well? How do you stay calm and remember with so many different tasks? Once you have an idea about what kind of questions you could be asked then you need to make sure that you have done your research into the establishment. Is it a standalone restaurant, part of a larger group/chain, what foods and drinks do they serve, what hours are the open, what kind of people do they attract etc. Once you have a good idea of the place, you could even visit yourself and see the other side of it but will give you a good idea of some of the things you want to look at in order to understand how they work. Your interviewer will need to know that you can work under pressure so you must be able to demonstrate this by talking about previous work history in this way. They will also want to know how hard working you are and how you will cope being on your feet for a busy shift. Best Wishes. Let us know if this guide was helpful for you via commenting form below.